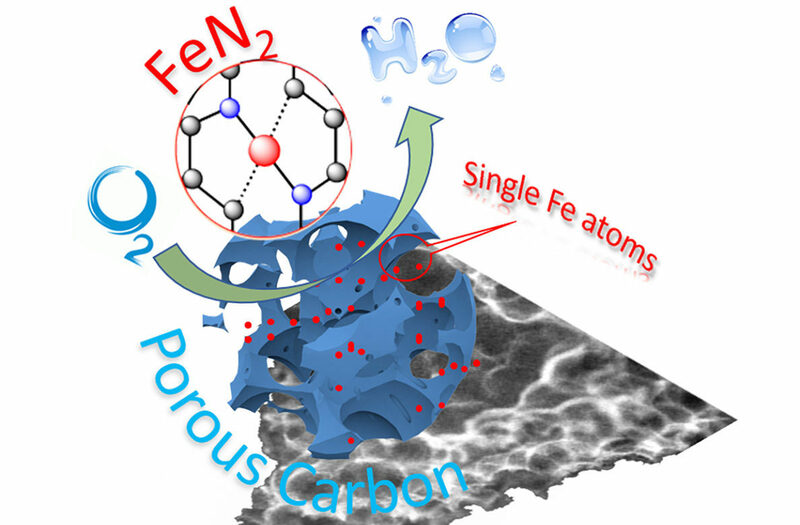 Schematic illustration of single-atom catalyst anchored on porous carbon. PULLMAN, Wash. – Researchers at Washington State University have developed a new way to make low-cost, single-atom catalysts for fuel cells — an advance that could make important clean energy technology more economically viable. Their work is published in the Advanced Energy Materials journal. Hydrogen fuel cells are critical for the clean energy economy as they are more than two times as efficient at creating electricity than polluting combustion engines. Their only waste product is water. However, the high price of the platinum-based catalysts that are used for the chemical reaction in fuel cells significantly hinders their commercialization. Instead of the rare platinum, researchers would like to use nonprecious metals, such as iron or cobalt. But reactions with these abundantly available metals tend to stop working after a short time. “Low-cost catalysts with high activity and stability are critical for the commercialization of the fuel cells.” said Qiurong Shi, postdoctoral researcher in the School of Mechanical and Materials Engineering (MME) and a co-first author on the paper. Recently, researchers have developed single-atom catalysts that work as well in the laboratory setting as using precious metals. The researchers have been able to improve the stability and activity of the nonprecious metals by working with them at the nanoscale as single-atom catalysts. In this new work, the WSU research team, led by Yuehe Lin, an MME professor, used iron or cobalt salts and the small molecule glucosamine as precursors in a straightforward high temperature process to create the single-atom catalysts. The process can significantly lower the cost of the catalysts and could be easily scaled up for production. The iron-carbon catalysts they developed were more stable than commercial platinum catalysts. They also maintained good activity and didn’t become contaminated, which is often a problem with common metals. Lin’s group collaborated on the project with Scott Beckman, an MME associate professor at WSU, as well as with researchers at Advanced Photon Source at Argonne National Laboratory and Brookhaven National Laboratory for materials characterization. “The advanced materials characterization user facility at the national laboratories revealed the single-atom sites and active moieties of the catalysts, which led to the better design of the catalysts,” said Lin. The work was funded by a WSU startup grant and by the U.S. Department of Energy (DOE grant numbers: Brookhaven National Laboratory, DESC0012704; Argonne National Laboratory, DE-AC02-06CH11357).